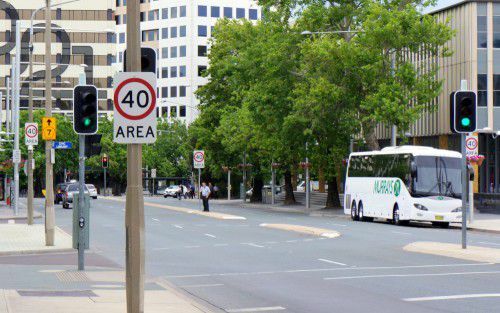 MEEGAN Fitzharris has invited Canberrans to provide feedback on the 40 kilometre per hour (40 km/h) speed limit precincts in Canberra’s group centres. “It has been around nine months since a 40 km/h speed limit was introduced in group centres and we are now seeking your feedback to help evaluate the slower speed environments and their effectiveness in improving safety for road users,” Meegan said. “We would like feedback on Amaroo, Calwell, Charnwood, Chisholm, Conder, Curtin, Dickson, Erindale, Hawker, Jamison, Kaleen, Kambah, Kingston, Kippax, Manuka, Mawson, Wanniassa and Weston. “In addition to this community consultation, speed and traffic volume surveys will be conducted at selected group centres. “The 40 km/h speed limits are in place on a fulltime basis (24 hours a day, seven days a week). They were introduced following community consultation on the proposed precinct boundaries. “Research indicates that the introduction of a 40 km/h speed area can significantly reduce the risk of death for vulnerable road users. For example, a 10 km/h decrease in speed can reduce the risk of death for pedestrians and cyclists by over 50 per cent. “The ACT Government started introducing 40 km/h speed limits in the Gungahlin, Woden, Civic, Belconnen and Tuggeranong town centres in 2011. “I encourage local residents and traders to take the time to have their say on the effectiveness of the slower speed limits in group centres. “To provide feedback, simply complete the online survey at timetotalk.act.gov.au or a hard copy survey is available at all public library branches. Consultation closes Thursday 10 March 2016,” said Minister Fitzharris.